Although bees aren’t the only pollinators (which can include birds, animals, and yes — even us), they are known as “keystone organisms,” doing most of the pollinating for most land ecosystems. They are essential to sustain forests, pastures, fields, roadsides, agricultural crops, fruit trees, and backyard gardens. Simply put, without bees, flowers and vegetables languish without blossoming and creating fruit, produce, and seeds. Contrary to popular belief, most bee species are solitary, with each female bee building her own nest. Some gregarious species do nest near each other, but they do not live in groups like social bees, which include honey bees and bumble bees. 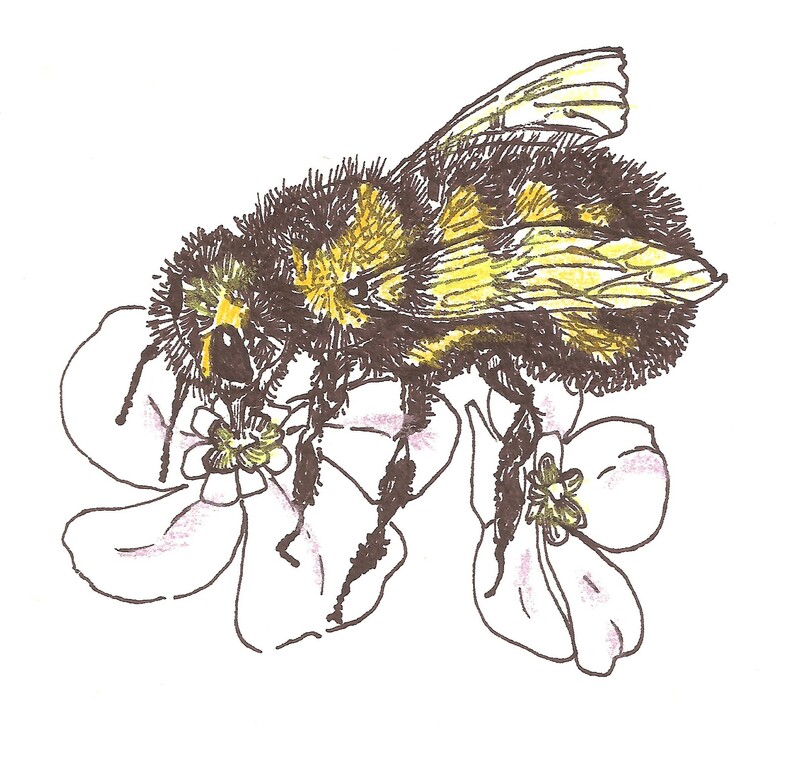 The more than 270 species of native bees in Maine include: plasterers, such as the yellow-faced bees; sweat bees; miner and sand bees; mellitids, or soil-dwelling bees; leafcutter and mason bees; and bumble bees. The blue orchard bee, or Osmia lignaria, shown here, is a superior pollinator of apples and will often occupy nesting boxes. Pollution and Pesticides — Air pollution, light pollution, and especially insecticides, fungicides and herbicides can be major threats. Insecticides used on seeds can affect pollen, and so-called “sub-lethal” amounts can impede insects’ abilities to navigate and forage. (“Bee Deaths Prompt Calls for U.S. to Ban Some Pesticides.”) Cutting pesticide use or at least using best practices can make a big difference. Habitat Loss — As we develop and degrade more land, pollinators lose suitable nesting spots and may be trampled by foot and/or car traffic. Non-native Plants and Species — Although some non-native plants can be of benefit, the quality of pollinator habitat may be diminished when non-native plants either attract the pollinators away from a richer local food source or crowd out wildflowers essential to specific species. The introduction of foreign insect and bee species has also spread disease among the native populations. How can you help? Plant native plants when possible, install bee walls and houses, and DON’T use chemicals! Even a tiny garden or streetscape can become a beautiful habitat as well as a visual amenity. Visit the DIY/Useful Links Page for resources on how to build your own bee walls, which plants to choose, and more.